Magharebia, by Hassan Benmehdi (Casablanca, Morocco, June 27, 2013) — The Arab Spring brought a promise of sweeping change, but Maghreb societies are still short-changing women’s demands for equal rights. And according to participants at a recent Casablanca conference on women’s rights, a lot more work needs to be done to end gender discrimination in the region. 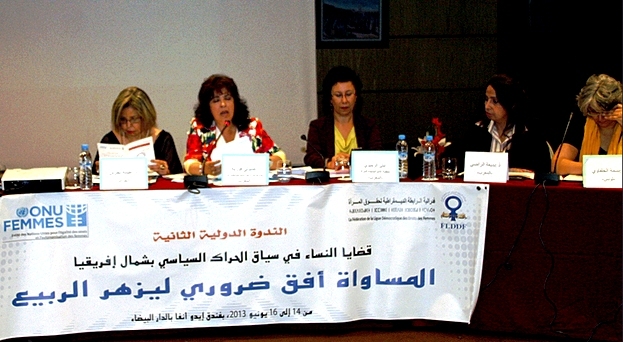 “Contrary to what we hoped would come from the Arab Spring, we’ve even lost the few rights we previously had,” Nafissa Lahrache, the president of the Algerian Association of Women in Communication, said at the June 14th-16th forum. It was the second event spearheaded in recent weeks by Morocco’s Democratic League for Women’s Rights (FLDDF) and the Rabat office of the United Nations Entity for Gender Equality and the Empowerment of Women (“UN Women”). First and foremost, the Arab Spring was an effort to bring about more democracy and social justice throughout the region, FLDDF head Fouzia Assouli told Magharebia. “Women, just like young people and all those making up our society, have campaigned for their rights, equality, equity, justice and democracy,” she said. Women have the right to ask such questions and press for raising their status as equals to men, Assouli added. Organizers billed the conference as an opportunity for activists and feminist organizations to take stock of achievements and failures in the regional fight for human rights. Following the Arab Spring, Maghreb women have still not managed to secure promised rights, Libyan lawyer and political activist Nivine Abdelfettah said. Forum participants also agreed that there still was a long way to go before the process of democratization could improve the lives of women and young people, whom they described as the main drivers of change in North Africa. Toward that end, it is important to strengthen the hand of women’s movements within non-governmental organizations and charities, political parties and unions, said “UN Women” regional representative Leila Rhiwi. At the first forum organized by the FLDDF, a Tunisian researcher in comparative religion was careful to refer to the “Arab Movement” instead of the “Arab Spring”. This was deliberate, Amal Karami said, because she had not yet seen an Arab Spring. “There is a huge clash in the Tunisian street between the modern and salafist currents,” she said at the April event in Casablanca. “There are numerous discourses moving in the direction of the Islamization of the state. There are attempts to destroy the achievements women have made over decades,” the Tunisian researcher noted. And it is women who pay the price for the Wahhabist plan, Karami added. A member of Libyan NGO “Nisaa Quadimoon” (Women are Coming) painted an even bleaker picture. “There are plans to oust Libyan women, marginalize them and dwarf their role. This is unfortunate because women’s aspirations to improve their tragic situation were great under the former regime,” al-Naas added.